Please contact the laboratory for more details about the genera of orchids you wish to have cloned because the type of plant material required to initiate cultures and stage of development of that plant material differs from one genus to another. Unfortunately we can no longer accept plant material from outside Australia for cloning. This is due to the extreme difficulty in obtaining permits both to import your plant material and also to send the flasks of plants back to you. Standard tall flasks of 25 plants per flask for Cymbidiums and Zygopetalums, photo 3 right hand flask. Maxi tall flasks containing 25 to 40 plants per flask for Cymbidiums and Zygopetalums, photo 3 left hand flask. Other genera are generally supplied in Maxi flasks of 25 plants per flask. The flask shown in photo 4 above is a flask of Dendrobium clones. The minimum order is 100 plants per clone for all genera. An initiation fee of $50.00 + gst which is the same for all genera of orchids. This fee is payable when the plant material in sent to the laboratory. A delay in payment will delay the cultures being set up. Replating fee. 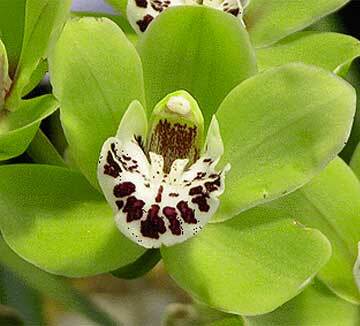 This varies depending on the genus of your orchid. Once advised that the tissue is growing and multiplying 50% of the replating cost is due. The balance of the final 50% of the replating cost becomes payable when the clones are ready for despatch, when clients will be contacted. Please contact the laboratory for details of replating costs. Discounts are available for clients ordering 100 or more flasks of one clone per year. Please contact the laboratory before sending leads or flower spikes so that they can be cultured as soon as they are received. The culture initiation medium is different for different orchid genera and we like to use very fresh medium to setup clones. To ensure the plant material arrives in good condition, please wrap new leads in slightly damp paper or sphagnum moss and place the cut end of flower spikes into a florist’s tube containing clean water. Place this material into a “post pak ” or similar mailing tube and send by courier or express post on a Monday. This will minimise the chance of it being delayed in the postal system over a weekend.